Ever since we moved into our 1920 house I have been repulsed (too strong?) 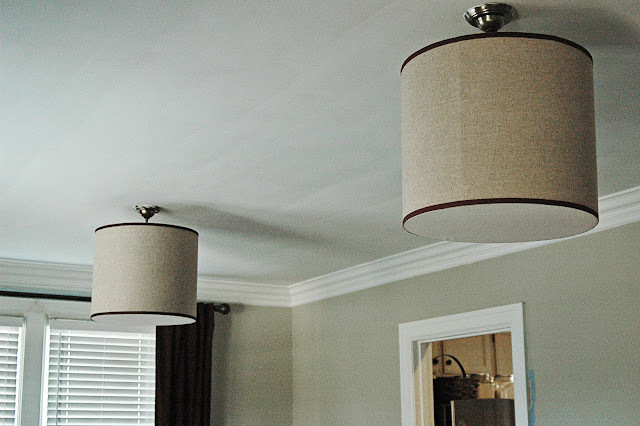 by the light fixtures in the living room. We first thought it would be a simple switch out to new fixtures until we realized there were no electrical boxes in the ceiling. In laymen's terms... NO GO. I had to improvise, but with what? 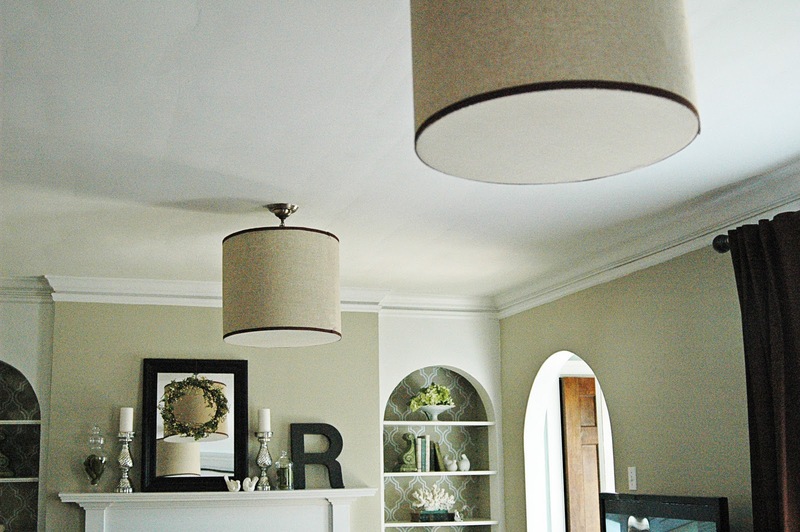 I soon found a post over at Young House Love about a DIY Drum Shade. I thought it was a great idea and totally "do-able." I just needed to make a few minor tweaks such as taking the clamps off the rings, redesigning the bottom cover, and finding a way to hang it. All that obsessing paid off! Fabric to wrap around drum aprox: 62"x 22"
Measure the height desired for the shade. Cut that height out of the plexiglass. Several pieces will be needed to wrap around the circumference of the loop. Use the wood glue to make a bead of glue on the solid inner wooden loop. 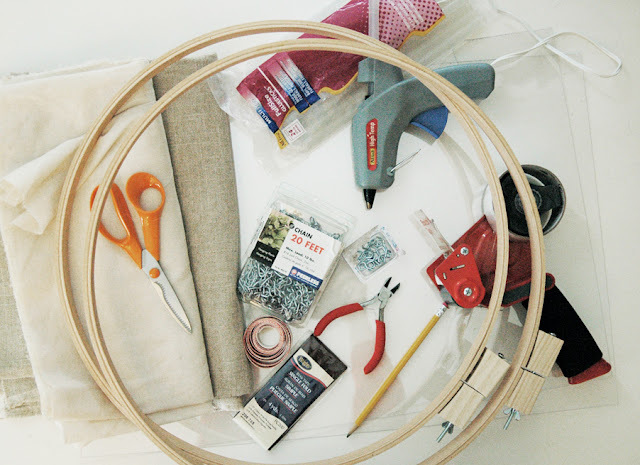 Attach the outer hoop and tighten. Let dry over night. Pop off the "handle" of the loop. Cut the fabric for the bottom of the shade: aprox 28" in width. Glue the fabric to the top edge (NOT SIDE EDGE) of the wooden hoop (12 o'clock) . Go to the opposite side of the ring (6 o'clock) and pull the fabric taught and glue. Go to the 3 o'clock section of the wooden hoop and attach then to the 9 o'clock spot. Continue this way until all of the fabric is secure with out puckers or bubbles. Trim the excess fabric off the loop making sure to stay as close to the edge as possible leaving little to no extra fabric. Continue all the way around the hoop. Attach the plexiglass with a small bead of hot glue 2" away from the edge of the plastic glass. Slowly Continue to work all the way around the ring making sure to keep the edges even to each other with no overlapping of the glass or hoop. 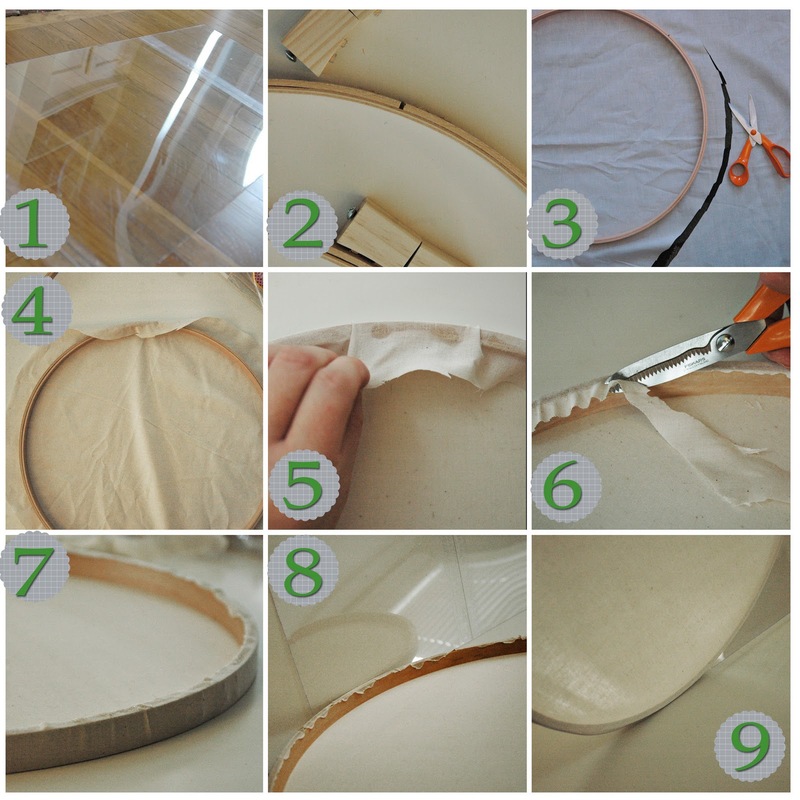 10 - Apply a bead of glue between the plexi glass and wooden hoop with the exterior of the hoop facing left and the plexi glass on the right. 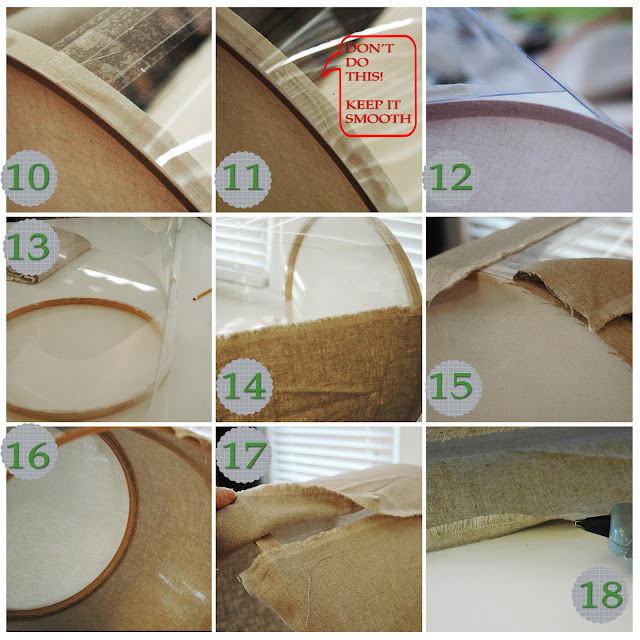 11 - Make sure the hot glue is smooth and flat between the wooden loop (bottom of drum) and the plexiglass. 13 - Stand up the shade. Make sure the work space is clean and free of hot glue drips. Attach top ring in the same manor the bottom ring was attached. 14 - Attach the fabric for the sides of the shad to drum starting at one of the joint sections. This is done to make sure that the fabric is attached on a straight line and wraps evenly around the drum. Do not glue to the edge of the rings - leave about 2” for later adjustments. PULL TAUGHT while working around the drum. 15 - Glue the bottom edge first leave a 2” space from the fabric joint. 16 - Repeat for the top open side of the fabric. 17 - Let glue dry for a few moments before finishing. 18 - Turn the edge of the fabric under one time and glue with glue gun. Let dry. 19 - Attach the finished edge to the side of the drum. 20 - Working around the edge of the drum make sure that the loose ends are attached now. 21 - Working with the open edge of the shade attach the fabric over the top of the hoop. 22 - Cut off excess. 23 - CAREFULLY cut off excess from the bottom of the shade. 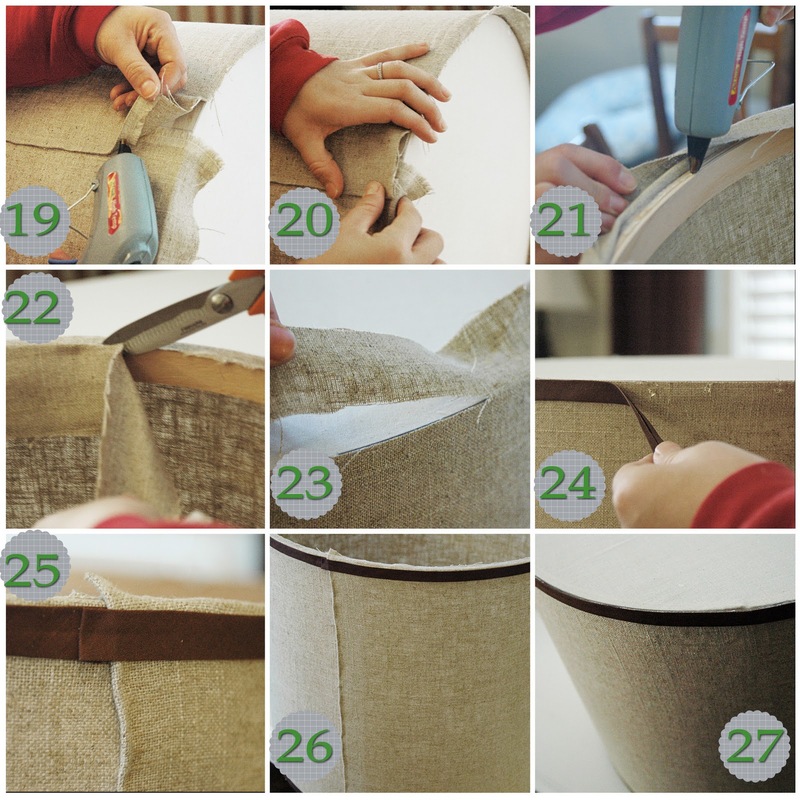 24 - Using Single Fold Bias Tape apply small dots around the edge of shade and secure tape. 25 - Fold over the cut edge of the bias tape and secure. 26 - Flip over and attach bias tape to the other edge. 27 - Cut off any strings or excess fabric. 28 - For calculating the dimensions for attaching the shade measure the exterior of the shade and divide into thirds. 29 - Holding the tape on the exterior of the shade mark three times for the placement of the eye screws. 30 - Attach the eye screws making sure not to puncture the plexiglass. 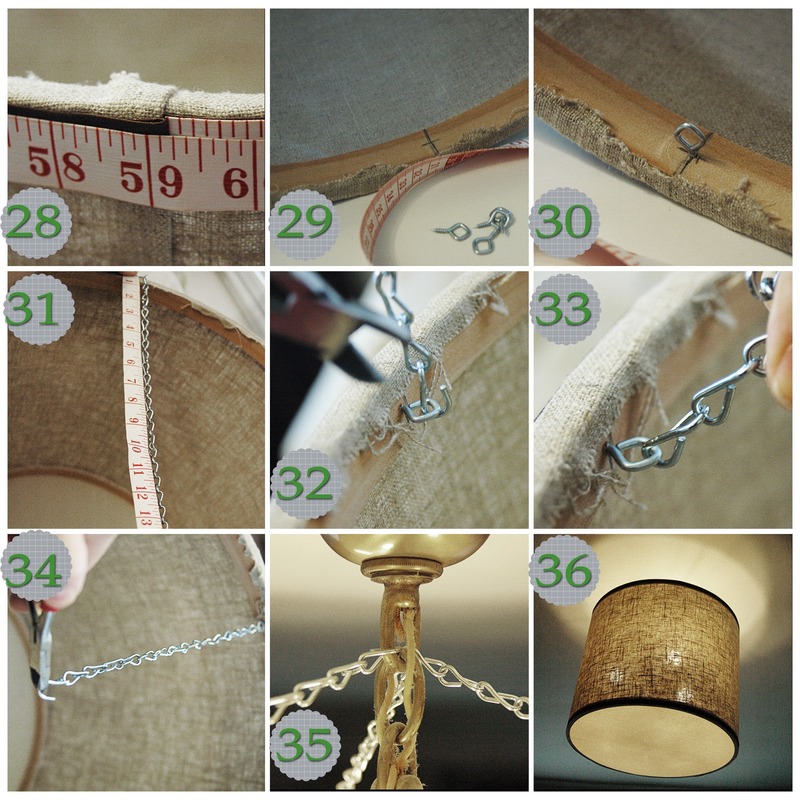 31 - Measure the diameter of the shade for the length of the chain. Take that measurement and divide in half and then subtract 1". That will be the length of the chain. My diameter was 19" divided in half is 9.5" - 1" = 8.5"
32 - Using the wire cutters or pliers open one end of the chain and hook it onto the eye screw. 33 - Close the open chain end. Repeat 2 more times. 34 - Leave the end of the chain open to attach to existing light fixture. 35 - Using a ladder I attached the chains to the existing light fixture. 36 - Turn on light and enjoy. Work on a clean space! Be cautious of the hot glue and where it drips. TAKE YOUR TIME! Do not rush the project. Cut off excess fabric - It will show as a shadow once the light is on. I forgot to mention the best part - It was only $42 for both shades!! That looks awesome...you have my wheels turning now! It's so great Tasha! Wow! Your tutorial is great too; so detailed! It amazes me how much bigger the living room looks! Tash, these are beautiful! I'd love to make them, but it sounds intense! I'll file this idea for later! you rock! mine next! i could make some stamps to block print the linen...forget my dream drum shade that costs over $300 at room and board. It isnt bad, kease! only took about an hour per shade. mary - it feels crazy huge now! ashleyAnn - its usually the other way around! thanks for the compliment! beth - great idea! this cost me less than $20 per shade! Wait! Only an hour and $20 per shade? That's crazy! Hmmm...where do I need one of these??? YOU are the mad scientist in the Roe house. Seriously sister, you. are. a. genius. WOW completely awesome shades & great tutorial. You have so much patience & talent! You go girl! THOSE LOOK AWESOME!!!! Great job, Tasha! I was so excited to find this tutorial. We have a very ugly brass chandy ready for a makeover. I have one question though - can you see them "seams" in the plexiglass when the light is on? You can see the seam. I placed mine where it cannot be seen very easily and on the non-traffic side of the living room - if that makes sense. When making the shade keep the fabric as straight, taught, and smooth as possible. The more fabric you fold over at the "joint" the more you will see when the lights are on. Thanks, Tasha! That does make sense. What about each place where you had to tape the plexiglass together. Can you see the tape or seam through the fabric when the light is on? From your pictures, it looked like there were several places you had packing tape holding the plexi together. That is what I was concerned about because from looking at the sizes of plexi available, I would have several of those seams. Thank you so much for answering my questions. 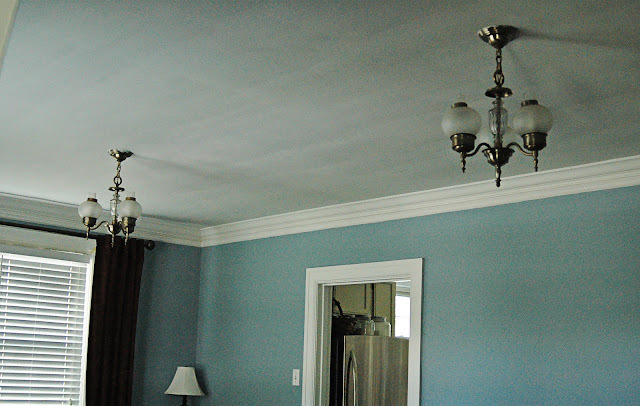 Your living room looks fantastic and I can't wait to give it a try. Well done! The effect is perfectly-clean and professional. Good call. What is it about hands? I'm gonna need a flatbed for the teen years! Total Concentration and Total Disgust. Natasha Roe is a participant in the Amazon Services LLC Associates Program, an affiliate advertising program designed to provide a means for sites to earn advertising fees by advertising and linking to amazon.com . 2017. Simple theme. Theme images by Ollustrator. Powered by Blogger.